All thresher shark species have a distinctive tail with an upper caudal lobe that can be as long as their total body length; used to stun prey. They also have the rare ability to increase their body temperatures above that of the surrounding seawater. This is most clearly seen in the head area, suggesting that individuals warm blood around their sensory organs so they can continue to hunt for prey in the colder depths of the sea. As with the other species of threshers, fertility is low, with females giving birth to two pups per litter through oophagy viviparity – a reproduction method in which developing embryos feed on a steady supply of tiny, unfertilized eggs. However, of the three species of Alopias, the bigeye thresher has the slowest population growth. Their major threat are gillnets and longlines set by Illegal, Unregulated and Unreported (IUU) fisheries on the high seas. Their extremely low fecundity, just 2 pups born per litter, leads to a low annual population increase rate making them susceptible to significant population declines. According to the IUCN Red List of threatened species, there currently is little active conservation work on this species. Enforcement of IUU fisheries on the high seas is recommended by experts to protect their rapidly decreasing population. Shark finning bans are increasing in number and should begin preventing bigeye thresher sharks being caught for the Asian shark fin market. 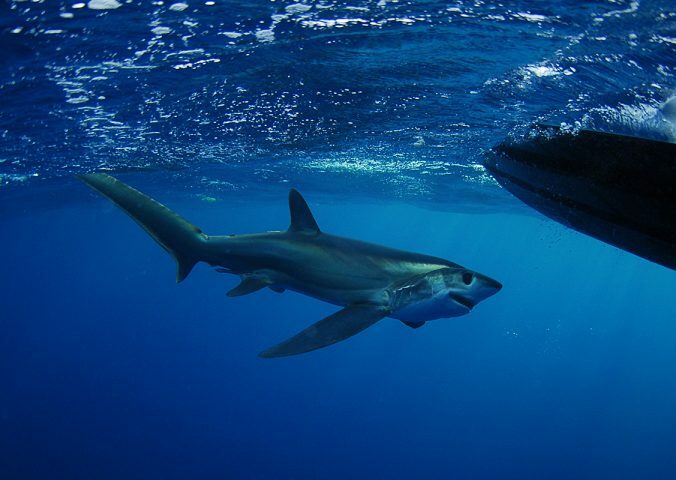 The bigeye thresher shark is also known as the false thresher, whiptail thresher, and long-tailed shark. The bigeye thresher shark has a circumglobal distribution in tropical and temperate waters including the Atlantic Ocean and Mediterranean Sea. Atlantic and Indo-Pacific populations are thought to be isolated from each other. The bigeye thresher shark is an epipelagic (lives in the surface layer of the ocean) species utilising diel migration – descending to deep waters during daylight and returning to shallower depths during the night. However, they have been recorded at a depth of 723m. They can also travel huge distances, with one tagged individual travelling 2,767km between New York and the Gulf of Mexico! Their prey typically consists of small predatory fish, squid and other elasmobranchs (cartilaginous fishes – skeleton is made of cartilage rather than bone). Bigeye thresher sharks have both a left and right uterus.